The Florida Panther National Wildlife Refuge (FPNWR)is not in the Florida Keys, but a portion of it dips into the northwest section of Everglades National Park. 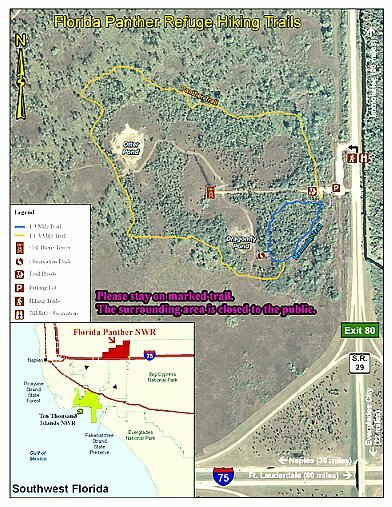 The Refuge is located in the Big Cypress Basin, 20 miles east of Naples FL at Alligator Alley aka I-75, and State Road 29. The Florida Panther sanctuary headquarters are located in Naples at 3860 Tollgate Blvd, Suite 300 in the Comfort Inn, Exit 101 off I-75. The phone number for the headquarters is 239-353-8442. This Refuge provides a safe habitat for the endangered Florida panther which has begun to make a comeback after the introduction of several Texas panthers into the region. This hardier stock helped to replenish a weak gene pool, and has resulted in the State animal beginning to have a favorable rebound. The 26,400 acres of the Florida Panther National Wildlife Refuge provides the perfect living and hunting grounds for the area's only big cat, as well as for black bear. The area is a mix of dense underbrush and hardwood hammocks comprised of cabbage palms, palmettos, cypress, gumbo limbo, and pine which blend into the wet prairie of the Everglades National Park. The Fakahatchee Strand, which is the largest cypress stand in the Big Cypress Swamp is included in this protected region. The area had been home to massive cypress trees, but was heavily logged in the mid-1900's severely depleting the cypress supply. Fortunately cypress has begun to regrow in the area. With it's regrowth, some of the areas native orchids, bromeliads and other vegetation has returned as well. Since the area is home to a number of rare and unique native orchids and bromeliads, an orchid lab is on the premises. This lab is involved in the collection and propagation of these native species and it also serves as the main center for reintroducing these orchids throughout southern Florida. With the near perfect Florida climate also comes invasive plants and animals. To help control invasive plant species, controlled burns are performed every year, and they rotate the locations on a 3 - 4 year cycle. Burns are effective in reducing the competition with native plants, plus they help to prevent uncontrolled burns which are caused by the numerous lightning strikes that occur during the rainy season. They also help to create more space for animals such as the white tailed deer which is the primary food source of the panther. With lush vegetation, an abundance of water, the warm Florida weather, and a plentiful supply of deer, rabbit, racoon, fox, wood stork, and other species, this Wildlife Refuge has helped the panther slowly regrow in number. 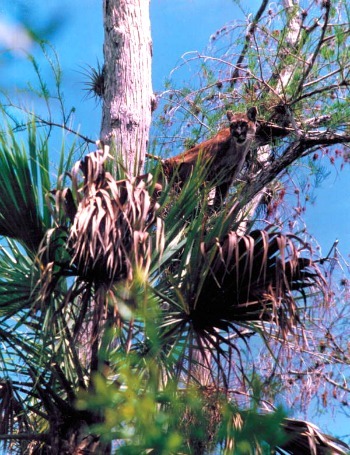 The Florida Panther National Wildlife Refuge is responsible for promoting better understanding and cooperation between the residents surrounding the area and the agency so the goal of protecting this big cat will succeed.